Traditional kitchens are one of our specialities at Divine Design Build. Given that we work in the Boston area, where antique homes and classic architecture are common, we're often called on to design kitchens that reflect and complement this aesthetic. We've designed dozens of traditional kitchens in the last few years (read our post about the characteristics of traditional kitchen design here) so if you're looking for inspiration for a classic kitchen of your own, here are a few of our favorite photos from our portfolio. 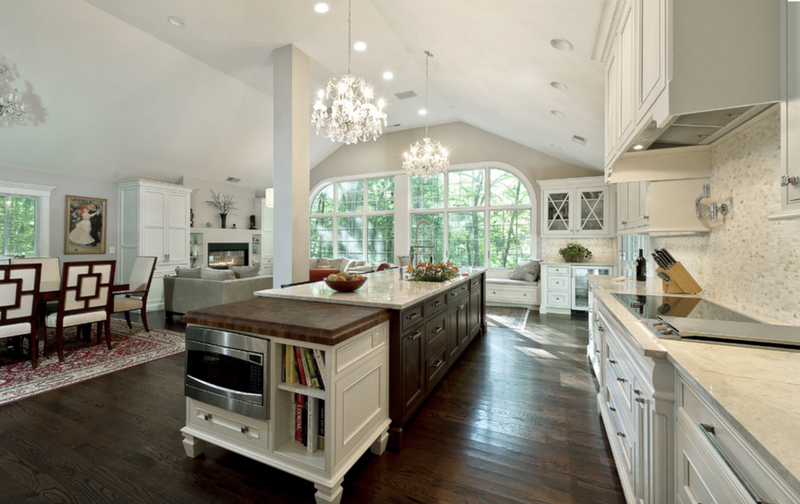 The kitchen above is in a home in Wellesley, Mass. Despite its traditional roots, this kitchen has plenty of unique details, like the statement lighting, two-tone countertops, and x-front glass cabinets. See more of this traditional kitchen on our Houzz Profile here. This next kitchen is in Dover, Massachusetts. The cabinetry, hardware, crown molding and countertop material all skew traditional, yet the gray and white palette make it feel updated, too. We nicknamed this next kitchen"tradition at its best" since it features many of the hallmark elements of classic design like recessed panel cabinetry, green-toned granite countertops, crown molding and a warm color scheme. This large kitchen in Newton, Massachusetts is another example of how traditional doesn't have to mean boring or homogenous. The striking combination of green-gray cabinets and a dark-stained armoire are original and unexpected, yet still maintain a traditional feel. For more traditional kitchen design ideas, visit our Houzz profile, or stop by our Wellesley, MA showroom to see our kitchen models in person.